To help celebrate Halloween and the release of Haunted by Your Touch, our very own Tradermare has come up with a contest where you could win a $25 amazon gift card or a Jeaniene Frost t-shirt! Are you getting ready for Halloween? Making lots of goodies for your trick or treaters? Perhaps a lovely little blood snack is on your menu or maybe some ghoul goodies? In the spirit of Halloween and all things Night Huntress, Frostfans is hosting a virtual “bake-off” contest. Entering is easy! 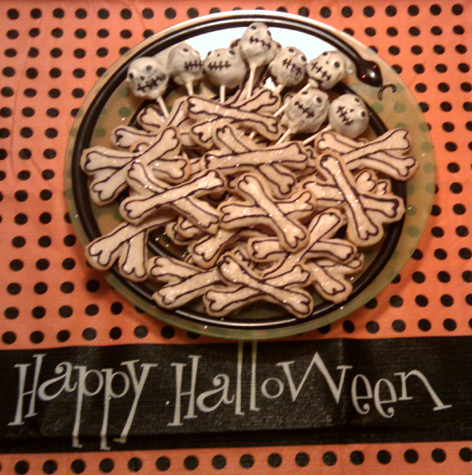 Get creative and make your favorite Night Huntress themed Halloween confection. Maybe you make a delightfully luscious “Cat’s Cherry Pie” or have been known to bake the ever popular “Lucifer’s Bouncing Balls”. Perhaps you can scare up some delicious “Denise’s Demon Brand Cookies”. Whatever your favorite Halloween treat, give it a Night Huntress spin and enter our virtual bake off! 1. You must be a registered member of frostfans to enter. You can register here. 2. Make your Night Huntress Halloween treat and don’t forget to give it a spooktacular presentation! 3. Take a digital picture of your entry, then upload to an image hosting service (like imageshack, photobucket, or flickr, for example) so you can link to it when you submit your entry. 4. Name your confection and write a sentence or two about your inspiration. 5. Post a picture of your treat, a brief description, and your inspiration to this thread starting October 7 through October 24. The thread will close for submissions at 11:59pm EST on October 24. No comments or discussion will be permitted on the thread. Bake-off entries only, please. All the entries will be displayed on the frostfans chat forum, and the lovely Tee will create a poll for voting. All registered frosties can vote for their favorite from October 25 to October 30. Prizes will be awarded to the top entry in the Frostfan community voting poll and another winner will be selected by the Judges Panel composed of Tee, Engarde and Wonttorit. Winners will be announced at the Haunted by Your Touch Release Party on October 31. So get out your spatulas, mixers and imagination, and have some fun! ***International entries welcome but you may be subject to import taxes, surcharges, and duties which are levied once a shipment reaches your country. Check out the Printfection website for more information.